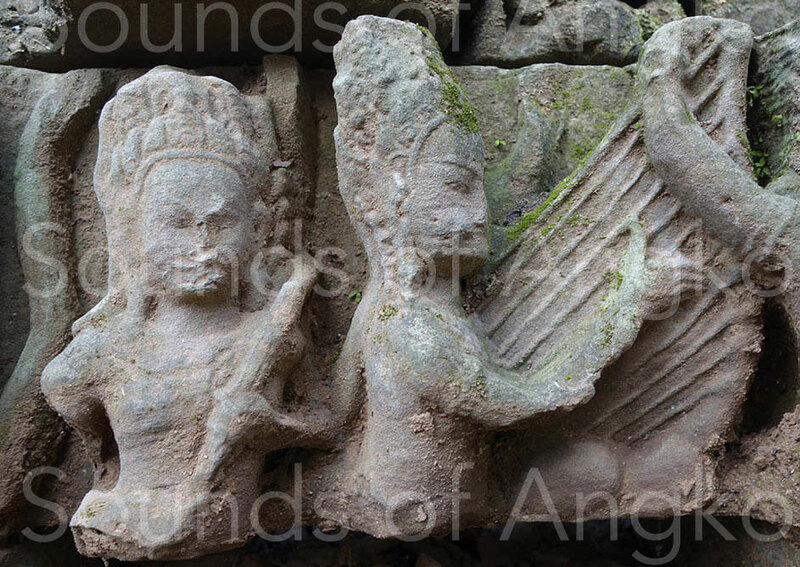 Angkorian harp - Site de soundsofangkor ! Representations of Angkorian harps are found in Angkor Wat, Bayon, Banteay Chhmar, Banteay Samre, Elephant Terrace, Preah Pithu and Western Mebon. The shape of the instruments differs according to the sculptors. There is no standard. All the harps, however, have in common a boat-shaped sound box and a handle more or less arched. The strings and the tuning system are sometimes represented. The head above the handle is a variable element. 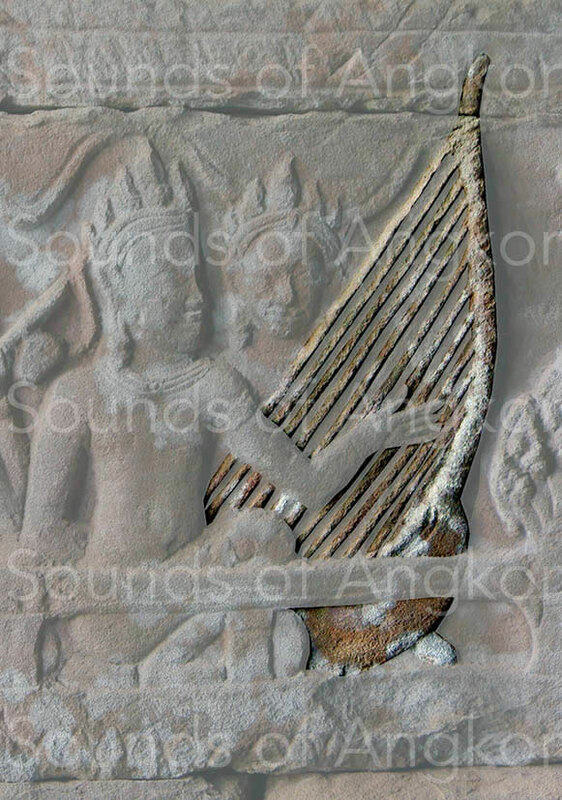 During the reign of King Jayavarman VII, late 12th-early 13th centuries the harp, accompanied by other instruments, animated the dance at the royal palace and in the temples, and also accompanied the entertainment. 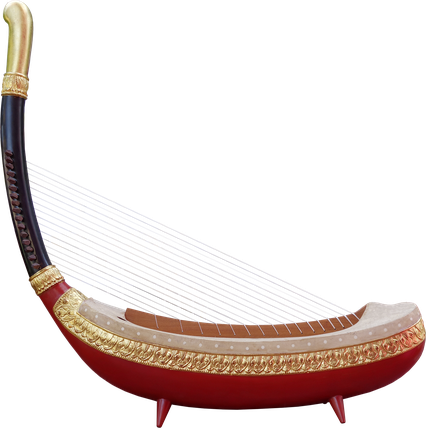 This orchestra, composed of 2 harps, 2 zithers, 1 scraper and 1 pair of small cymbals, animates the dance at the court of King Jayavaman VII. Bayon. 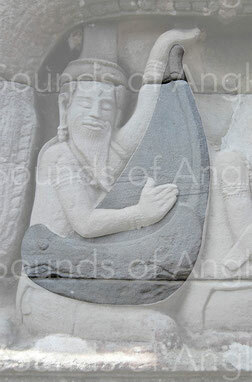 A sculptural detail of this harp gives us a precise knowledge of the tuning system in the 13th century (1). 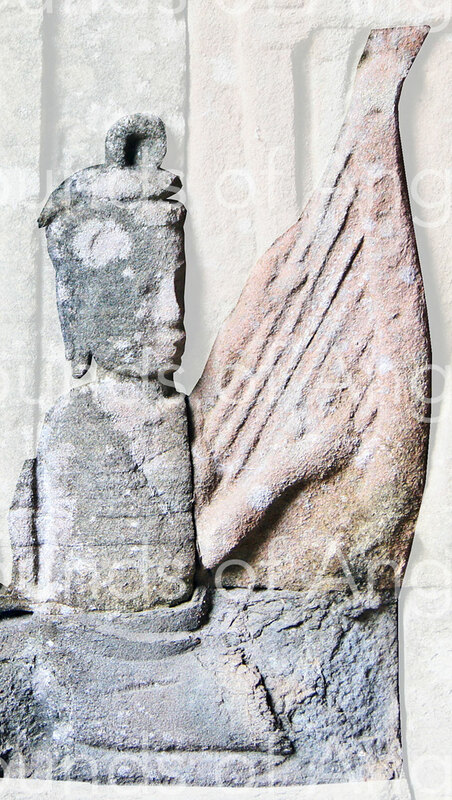 This high relief is damaged but the residual sculpture shows the essential: a peg tuning system. The end of the axle around which the rope is wound and the winding direction of the string. The pegs are on the left side for right-handed harpists, the majority case. 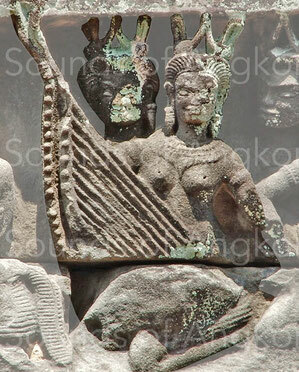 Another harp from the Elephant Terrace and some others at Bayon temple, with less precision, seem to have the same type of tuning. Some ancient harps of India were tuned with a braided necklace sliding along the neck. In the case of the Burmese saùng-gauk, it is a stringent stringing system nowadays increasingly supplanted by guitar mechanics. A Bayon harp shows this tuning mode. We clearly see links around the neck (3). 1. 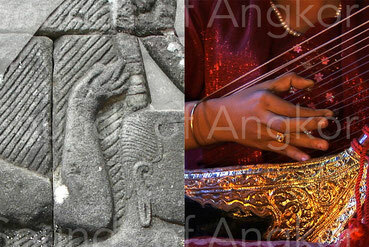 Garuda harp and detail of its tuning system. Elephant Terrace. XIIIe s.
2. The prominences visible on the handle of this harp probably represent the end of the axis of the peg on which the rope is wound. Bayon temple. 3. The strings are linked around the neck. Bayon. Last 12th-Early 13th centuries. How many strings lay the harps? Although they are often represented, it is difficult to draw any conclusion as to their number. Sometimes it can be considered that the sculptor represented them in large quantities without reference to reality. In other cases, the artist seems to have applied himself to sculpt them accurately. In ancient India, their number varied, according to the epoch, from seven to fourteen. 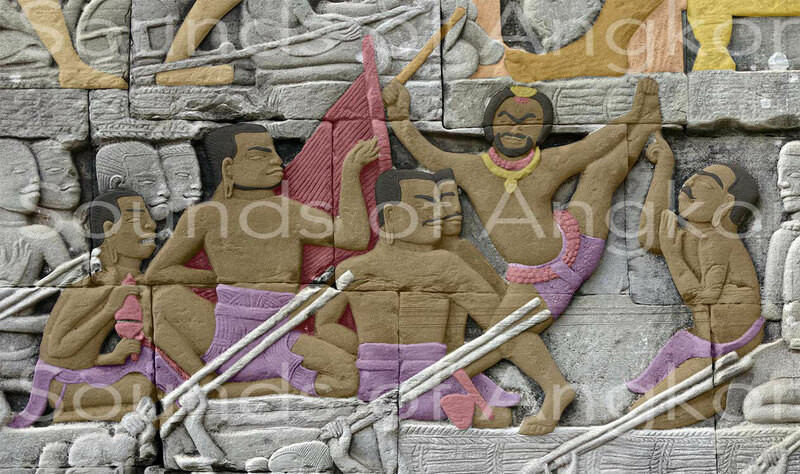 In Cambodia, the best representations depict a maximum of eleven strings. 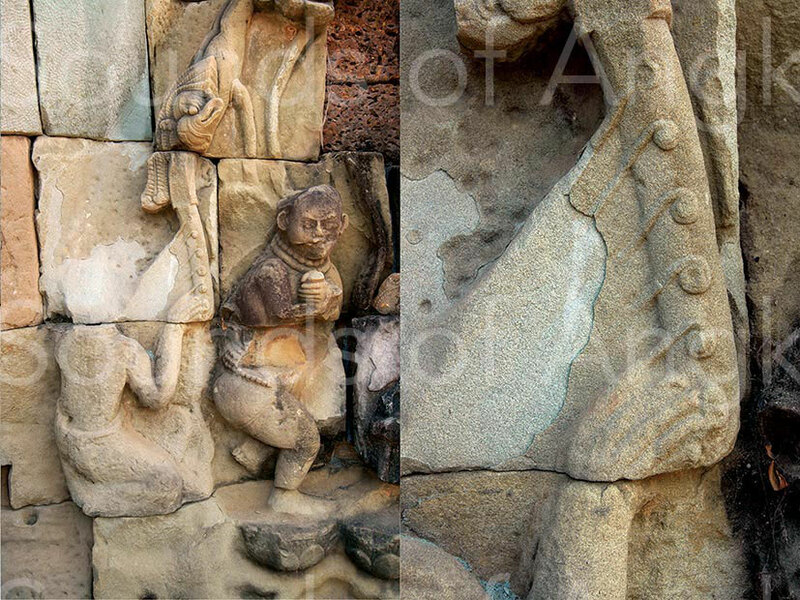 But the harp of Banteay Samre shows a minimum of 15 pegs but some of them are broken; however the quality of the sculpture is fine. In ancient India, their number varied, according to the times, from seven to fourteen. 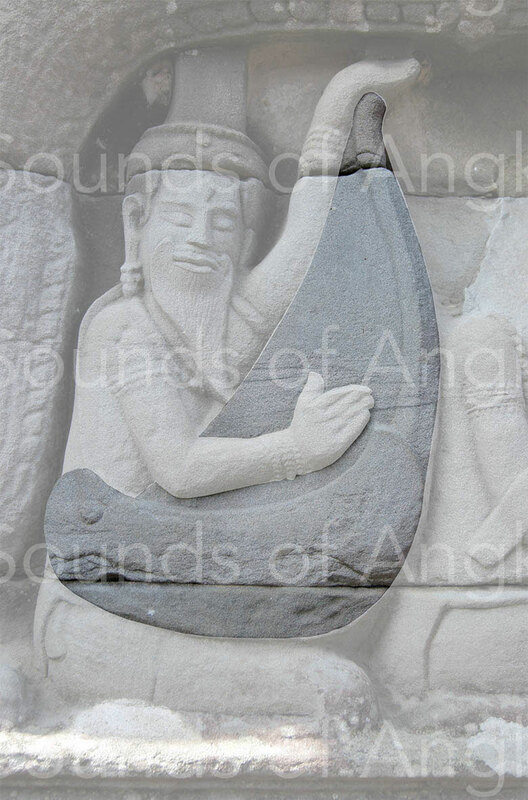 For this high relief, the artist seems to have taken extreme care to represent both the eleven strings of the harp. Bayon. You see here two harps represented one behind the other. The one at the back shows 15 tuning pegs and some are broken. Banteay Samre. Harp accompanying a dancer. Strings and pegs of indefinite number have been represented. Bayon. 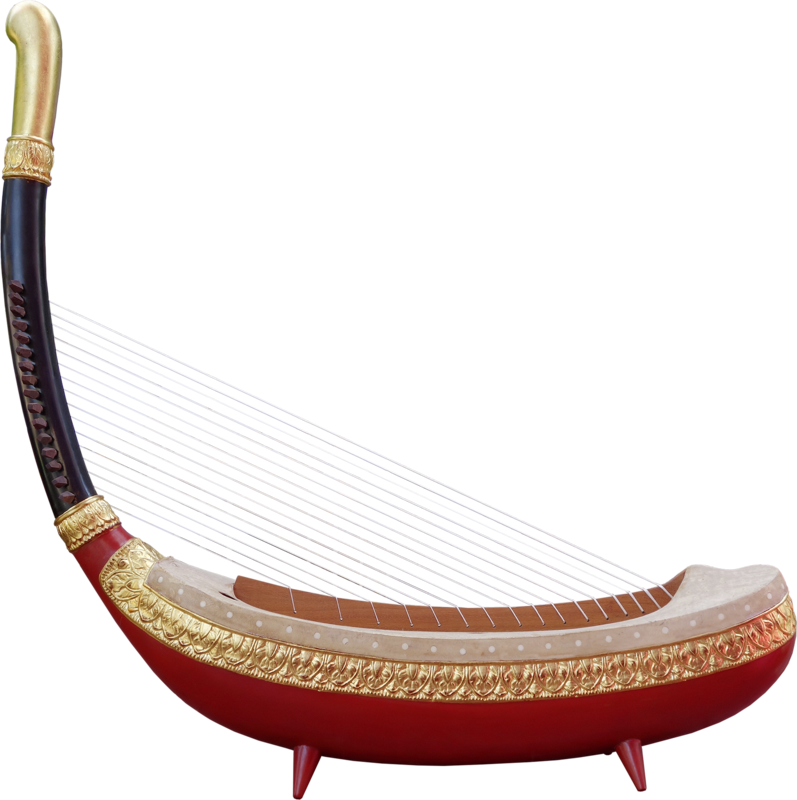 Court harp of King Jayavarman VII with 11 strings. Bayon. No source tells us the nature of the strings. 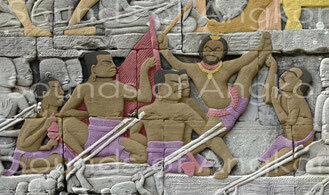 However, if it refers to Burmese ethnology, it is likely that they were made of silk. We know that the ancient Khmer people imported silk from China. 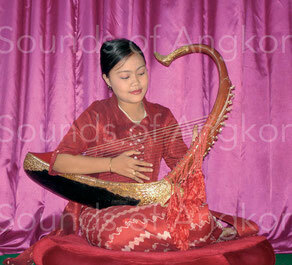 Moreover, the use of silk makes it possible to adapt the diameter of each string, like for contemporary Burmese harps. 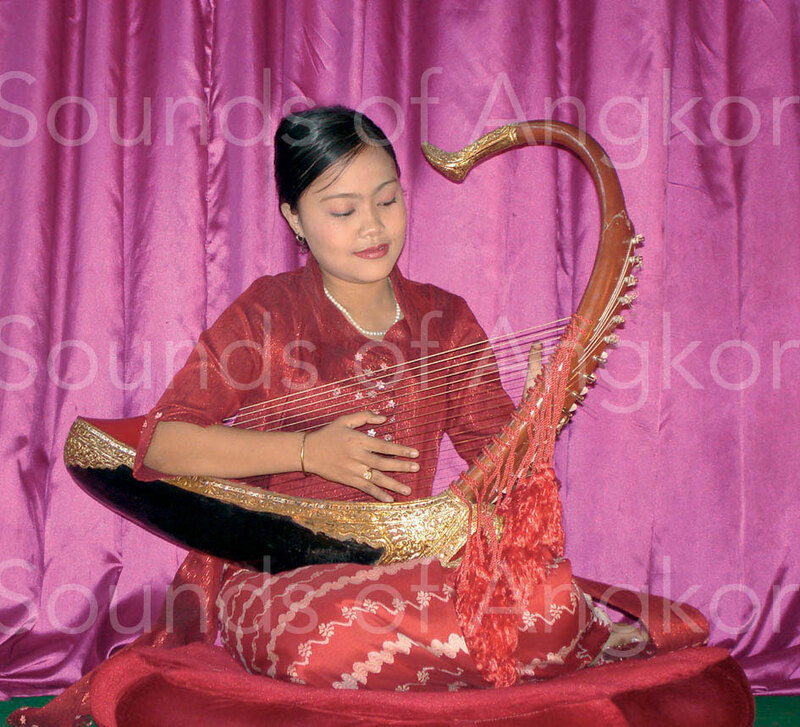 Burmese harpist playing on silk strings. All the sounds boxes shown are of boat-shape. Few details appear. If we rely on contemporary instruments, it is very likely that they were carved in a piece of wood and covered with a skin. No decoration is visible. The harp is played in a sitting or standing position. The musician sometimes holds his instrument with a shoulder strap. On the Banteay Chhmar instrument above, the button for fixing the strap is shown. The musician is mostly placed to the right of his instrument, whether sitting on the ground or standing. Harpist of the Eastern gopura, Eastern lintel. 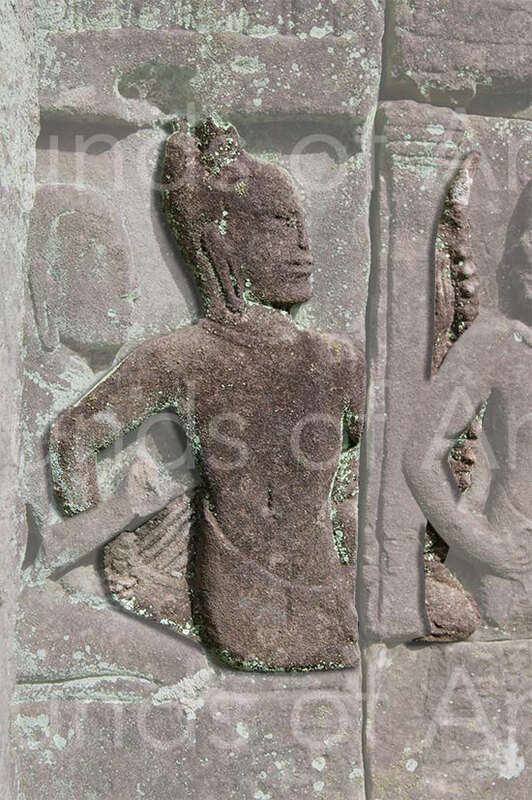 Banteay Chhmar. 12th-13th c.
Harpist in standing position in a procession. Strings and pegs of indefinite number have been represented. Bayon temple. Here, the left hand is placed on the bass strings. Bayon. If the right hand played the melody, the left hand probably had a technical role, either accompaniment or play of the bass strings or, as is the case with the Burmese saùng-gauk, of accidental alterations by pressing with the thumb on the string near the handle, or all this at once. 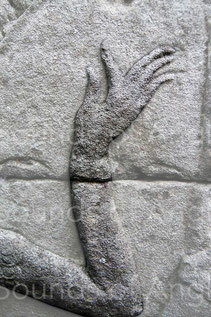 On the bas-reliefs, the right hand is sometimes sculpted with great realism. 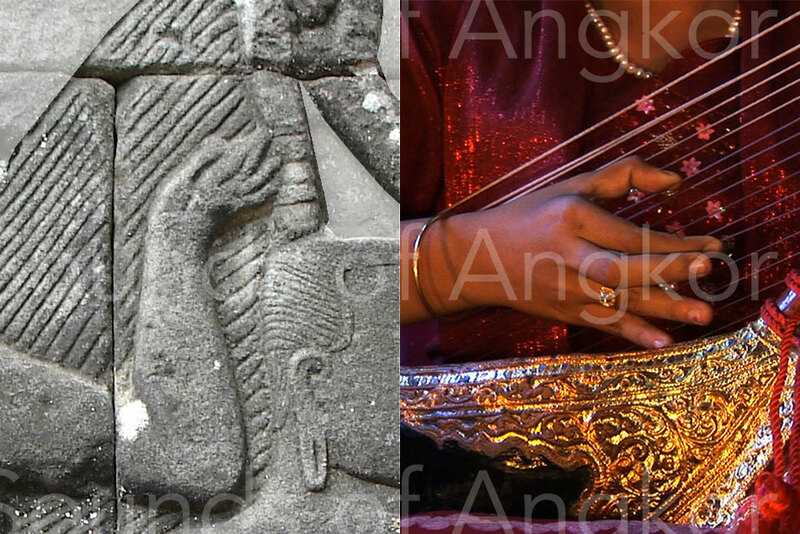 The combination of the best representations of the Angkorian sculpture and the playing technique of the Burmese harp reveals several similarities as below where the index and the middle finger are joint. A delicate sculpture anxious to show the beauty of the gesture rather than the strings. 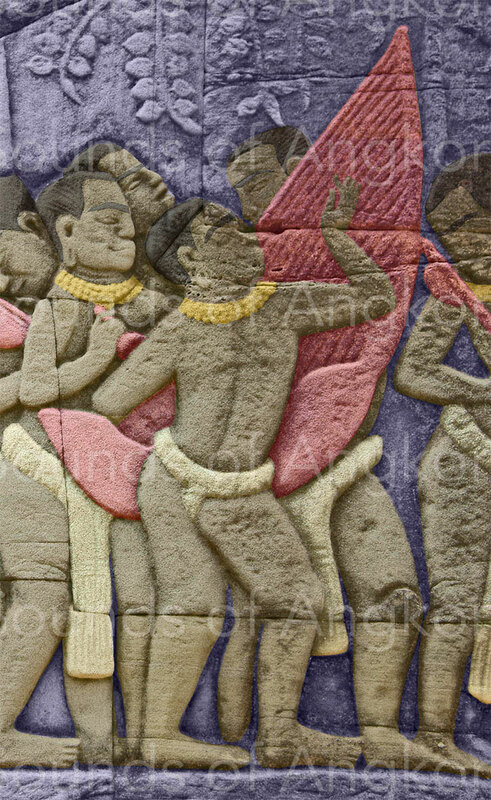 Banteay Chhmar. The temple of Banteay Chhmar offers three exceptional representations of harpists in three lintels. A possible fourth one, now buried under a heap of stones, will perhaps reveal the day when it will be raised. These three bearded harpists, with their eyes closed, wearing a bun, wear earrings. They are probably Brahman. 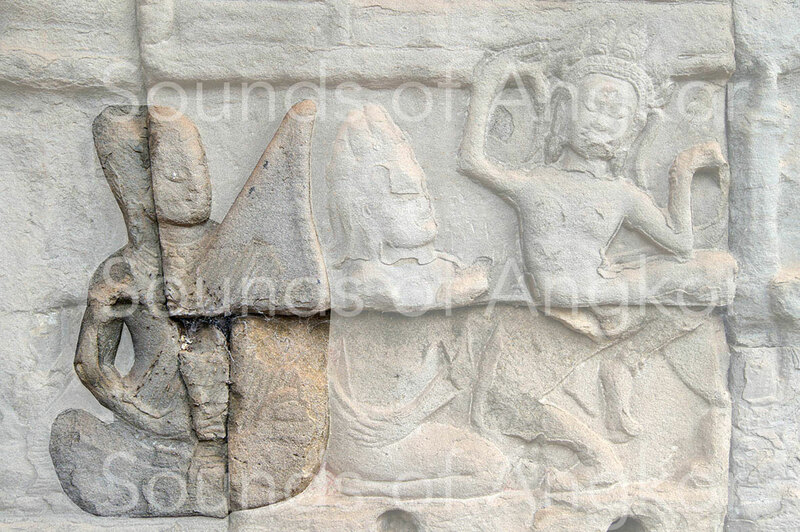 The three lintels and harpists of the east gopura from Banteay Chhmar; from left to right: south, east, north. Banteay Chhmar. Since its reconstruction by Patrick Kersalé, the Angkorian harp is taking a new lease on tourists visiting Cambodia, on television sets or on stage. It also adapts to other forms of repertoire than traditional Khmer music; with its boat shape, it is now able to sail and to make stops (ESCALES) anywhere in the world!